Welcome to the next Edition of the Newcastle Convention Newsletter. The BHA Convention website is fully functional and jam packed with great information about the coming Convention in Newcastle which is due to start on Wednesday 28 September 2016. Visit the website via the link below to find the following information about this, the 14th National BHA Convention. It also has the distinction of being our first annual Convention. Don't delay, get onto the website and check it all out. 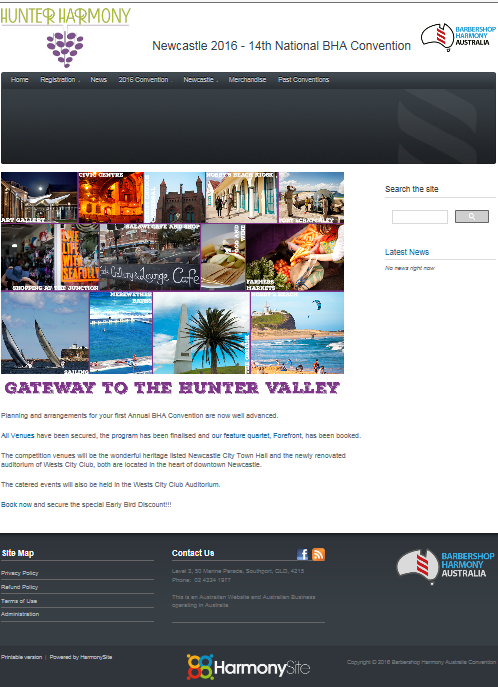 Newcastle offers a wide variety of accommodation options ranging from budget rooms in backpackers or pubs, to self-contained apartments and 4.5 star hotel options. Below is a summarised list of accommodation options located in close proximity to Newcastle City Hall and The Wests City Club. Many of these hotels are also within easy access to the fare free bus zone, which operates between 7:30am and 6:00pm Monday to Friday. The club also features several first class eating venues including Wests City Kitchen and Wests City Patisserie, both with impressive menus to choose from, designed by the club’s head chef Hudson Daley. To save time signing in each time you go to this club, apply for membership NOW. Or… fill in the application form (see link below) and take it with you, and complete the process when you arrive in Newcastle. NOTE: be aware that when either using the link and completing the process online, or, filling out the form, you will need to produce ID (Driver’s Licence is OK) when going to reception to collect your membership card.